(Tech Xplore)—A Big Idea to chew on: What if we could shake up the relationships between food production and food consumption in such a way that may benefit more people? Research in Finland offers tantalizing signs that a change like that might be possible. New Scientist referred to the research concept as your kitchen-counter bio-lab. You park a device on your kitchen counter and it grows your food. This home appliance could grow food from plant cells, that is, and achieve it in a week's time. The small machine is called a bioreactor. The appliance looks like a design lamp; the researchers, from VTT Technical Research Center of Finland are developing a prototype of this countertop vessel. They use it for growing edible plant cells. Lauri Reuter, VTT research scientist, was quoted in Fast Company: "With climate changing in very unpredictable ways right now, it's agriculture that will be hit the most." That's a massive problem, he said. Considering the food we eat is linked to fields and the environment, "when the conditions on the field change, then we are in trouble. Mallory Locklear in New Scientist saw the situation likewise: "as populations grow, available farmland dwindles and climate change takes hold, we're going to have to find new ways to stabilise our food supply and fortify our diets." How do they "grow" food? What does that mean, in the kitchen, no less? They are talking about growing cells of a plant rather than a whole plant. Only the best parts of a plant are cultivated. The cells in use contain the plant's entire genetic potential, and they can produce the same healthy compounds such as antioxidants and vitamins as would the whole plant. "Cultured cells offer several benefits over the real thing," said Locklear. "For a start, our diets are largely made up of just eight crops, yet there are thousands of other plants we could be eating. Many contain important nutritional benefits, but not all are easy to cultivate. " Case in point: The nutritional value of a cloudberry cell culture, is like or even better than that of the berry, but one difference between the cell culture and actual berry is taste. "The taste still needs development: at the moment, it is very mild and neutral," according to VTT. 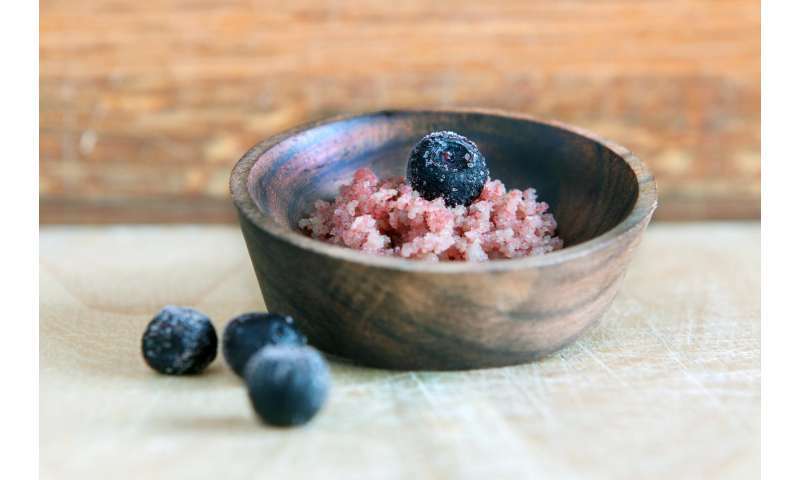 The VTT site reported that "So far, VTT has used cells from its own culture collection to grow Arctic bramble cells, cloudberry cells and stone bramble cells in the prototype." The food-growing process appears simple enough. In the words of New Scientist, you "pop in a pod of plant cells along with growth media, and wait for them to turn into jam-like food." What's next? The group is looking for a producer that can take the work, scale it up and commercialize it, said Locklear. In addition to kitchen use, "this type of mechanism might eventually be used to grow cultured plant cells in tailored facilities akin to microbreweries, or even at industrial scales." Adele Peters in Fast Company, meanwhile, reported that "the researchers are still considering the best direction for the final product, and would have to partner with another company to manufacture it. The product would also have to get regulatory approval as a novel food." I always though the idea of cultivating meat cells was cool, but this is another step up the ladder. Not only in terms of individual food variety but also when considering what this can mean for off-world applications (where farming isn't easily an option). No more prefabricated stuff that has to be shipped at atrocious cost into space (with attendant packaging and wasted parts). On long range missions or nascent colonies this could ensure adequate diets. On the down side there is a haptic quality to a berry that a cell mush doesn't have, but that is something that can be figured out in step two. Maybe printing a berry from the cells - with tougher cells on the outside to simulate the berry skin? Since it's just a cellular culture, I wonder if they could come up with some kid of kit system like that or crowdsharing lab thing for genetically modifying and growing different cultures, since you don't have to worry about the viability of the whole plant...Like you could come up with a banana-squash that's really delicious but could never survive in nature outside the context of the culture.